Play if… you like art and crazy inventions. Avoid if… you think the da Vinci Code was overrated or have an unnatural hatred for Renaissance Italy. Description (from the company website): As a rival inventor, you’ve been eager to discover the secrets of this mastermind. Now it’s your turn to get into his workshop and steal his sacred codex before he returns. Can you outsmart Leonardo? 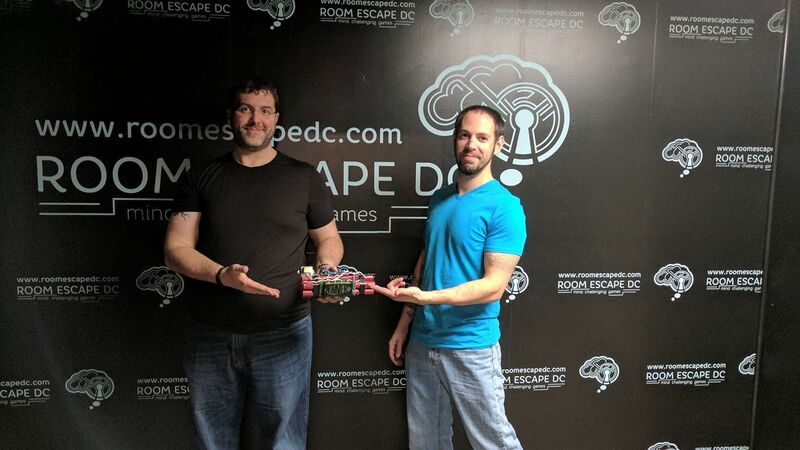 Note: The ERG were invited by Escape Room Woodbridge to playtest this room before opening to the public. We provided feedback once we completed the room. Our review below is based on our experience as it was during the playtest, so some items may have been altered prior to the room opening. Description of the room: You enter a room decorated like da Vinci’s workshop (plaster walls with some exposed brick) and decorated with artwork, inventions, scrolls of drawings, and some furniture. Understanding of the Mission: Infiltrate Leonardo da Vinci’s workshop, solve the puzzles, and find his hidden codex (containing sketches of his inventions and plans). 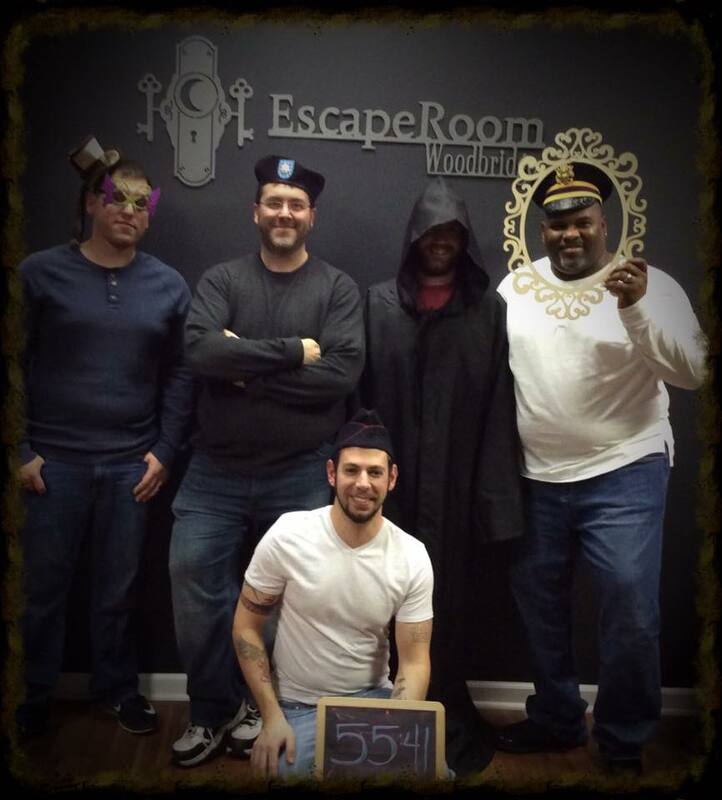 Team Disturbed Friends (Jason, Mark, Mike, Eric and Alphonzo) found da Vinci’s hidden codex! 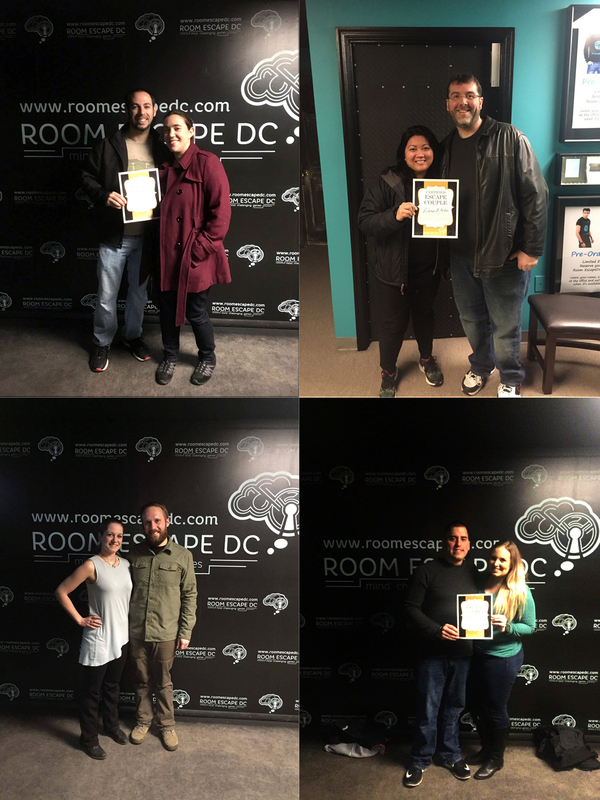 Photo courtesy of Escape Room Woodbridge’s Facebook page. Play if… you like a good detective novel and have an affinity for the 1920s. Avoid if… you can never remember the combination to your gym locker. Description (from the company website): You and your teammates are a group of Private Investigators back in the 1920’s. There have been a series of murders recently all with a mysterious calling card left at the scene. All clues point to the fact that the next murder will occur in 60 minutes. Try to solve the case and catch the murderer before time runs out! Staging Area: a very simple lobby with a few chairs and a coat rack. This place has a sample of each lock for you to practice on before entering the room. Metro Access/Parking: it’s in Leesburg, so you gotta drive, but there is plenty of parking. Description of the room: a small Private Investigator’s office, set in the 1920s… and a whole hell of a lot of padlocks. Understanding of the Mission: Investigate a series of murders and find the serial killer before he/she kills again. Did the room challenge the entire team? Yes and no. More on that later. 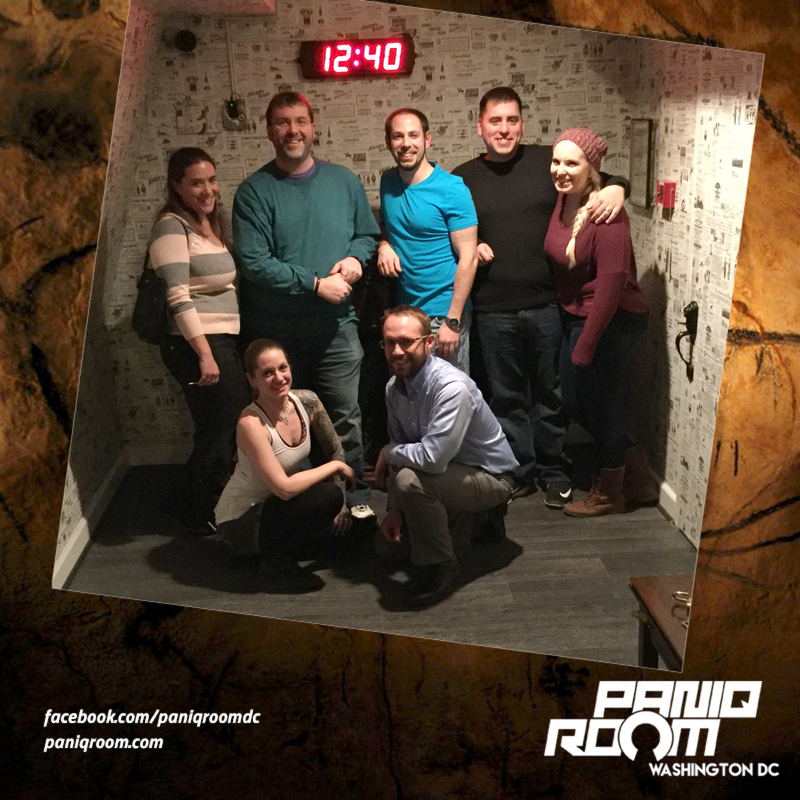 Team Disturbed Friends (Jason, Mike, Dalia, Alphonzo and Stephanie) solved the murder and caught the serial killer! Dog Money Brewery – stop in for pub food and a flight their brews. Home-made pretzels and dipping sauces are awesome. Avoid if… you need constant stimulation (giggity). Description (from the company website): You and a group of explorers stumble across a hidden temple deep in the South American jungle. Based on local legend that a hidden tomb in the area holds a golden treasure of immense value, your group decides to face the danger and attempt to enter the tomb, steal the priceless treasure and get out alive! Description of the room: You enter an ancient tomb, a la “Raiders of the Lost Ark,” and find some scattered artifacts. Understanding of the Mission: Find the lost treasure and escape the tomb before you get sealed in! Did We Escape: Yup, and we weren’t chased by a giant boulder or pissed off natives either (so, we’re essentially better than Indiana Jones). Our Suggested Party Size: We had 9, which may have been a few too many, so we’ll recommend 6-8. Did the room challenge the entire team? Yeah, everyone contributed, but maybe not on multiple puzzles. Members of our team (other than the ERG): Brittany, Corey, Gina, Shanell, Dalia, Chris, and Kevin. 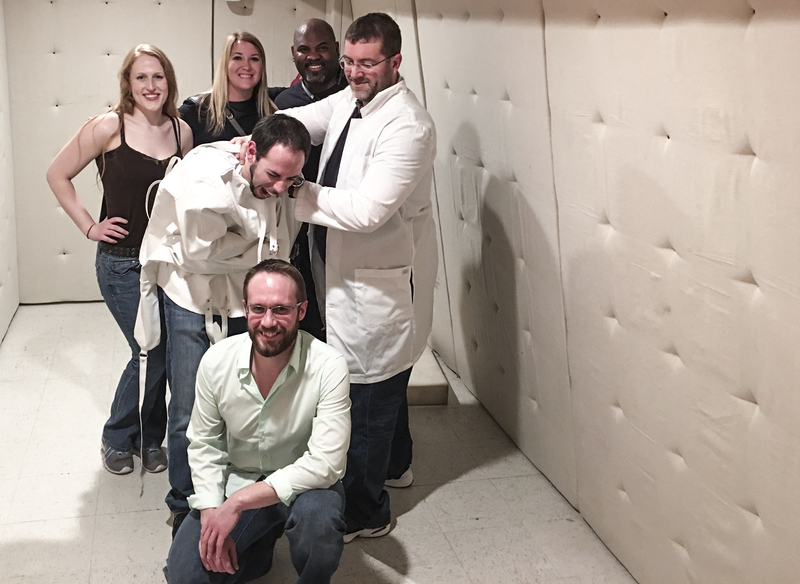 Team Disturbed Friends (Brittany, Corey, Gina, Shanell, Mike, Dalia, Jason, Chris and Kevin) found the idol and escaped the tomb! Photo courtesy of Escape Quest’s Facebook page. Play if… you’re good enough friends with someone that you don’t mind being locked up with them for up to an hour. Avoid if… you’re claustrophobic. Or don’t have anyone you consider that good a friend. Description (from the company website): You and your partner are astronauts exploring the awesome enormity of outer space. You’ve been dazzled by stars, and dodged black holes, and watched as celestial storms raged over the surface of foreign worlds. Then: in the distance, a fast growing light. You have inadvertently flown into alien territory, and one of their defensive vessels has open-fired on your ship. Your ship has been vitally damaged. In a last-ditch effort to save yourselves, you land on the nearest planet: Venus. Luckily, you have lost the alien trackers: for now… You only have one hour to repair your ship, and restore power, before the aliens hunt you down. The only way to tackle this captivating challenge is together. Two brains. One hour. Zero time to waste. Can you and your partner crack this cosmic conundrum? Description of the room: The room is small, but it’s only for 2, so adequate for the people. Sparsely decorated, it’s believable enough to be in a space craft. There’s writing on the floor, lights all over, and a computer on a desk next to a large locker with multiple cabinets. Understanding of the Mission: You are locked on a space craft that has crash landed, and you need to repair it within 60 minutes. Time Remaining: We’ll get into this later; Final Thoughts at the very bottom. Our Suggested Party Size: Well, it’s a 2 person room, so 2.